Product code: R844 Categories: Sold Items, Sold Rings. 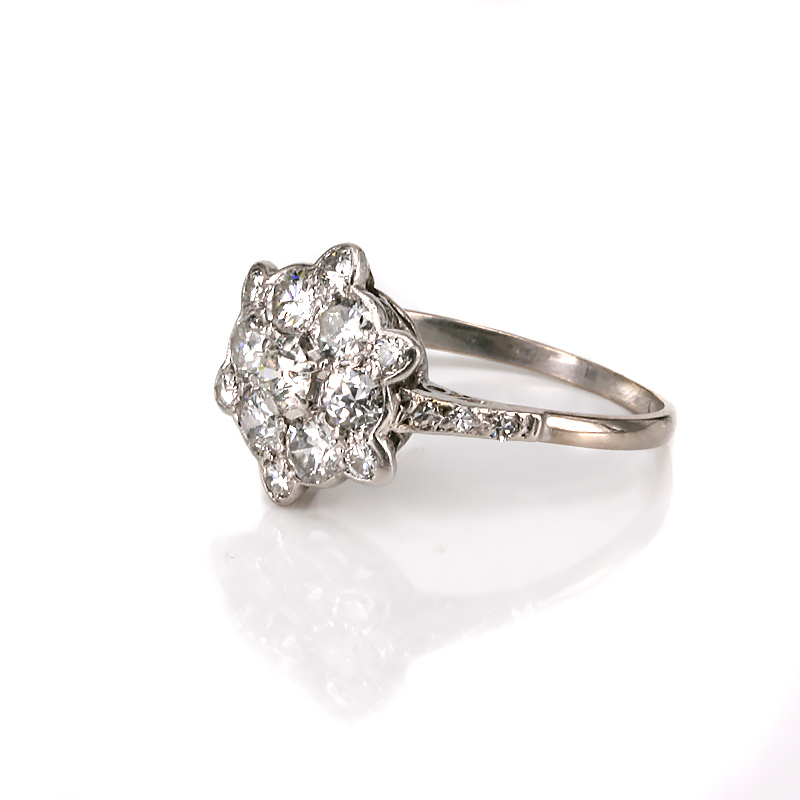 Beautifully hand made in the 1930’s, this Art Deco diamond cluster engagement ring is so attractive and made even more unique and special by having an additional six diamonds on the outside of the cluster. Traditionally a diamond cluster ring will have a central diamond surrounded by diamonds as is the case here, however with the extra six diamonds, this makes it really so much more special. 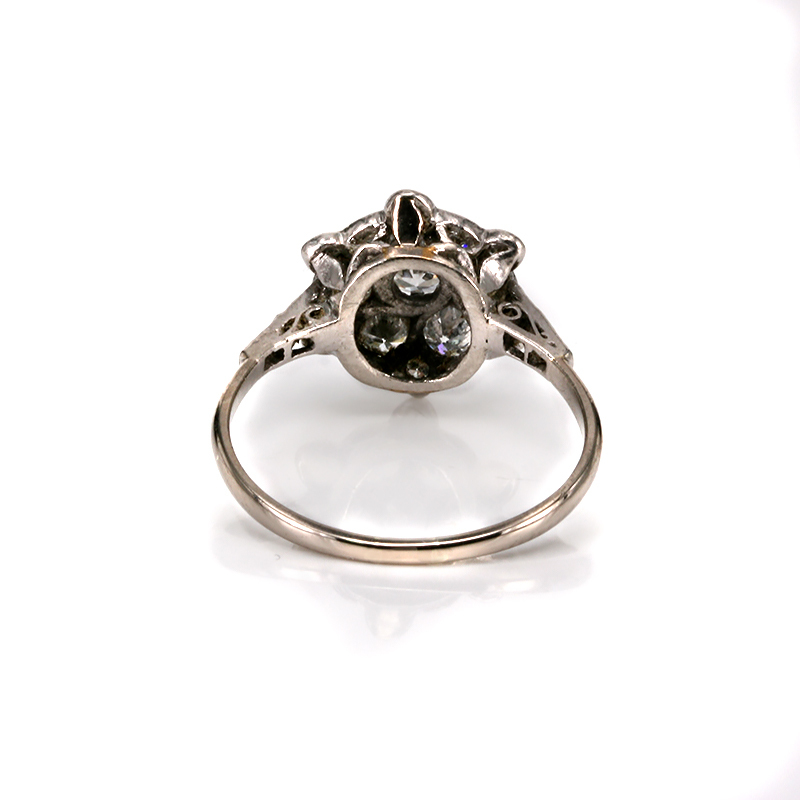 Then down each side are a further three diamonds that highlight this ring even more with the right amount of sparkle. The thirteen main diamonds total a dazzling 2.55 carats and the six smaller diamonds on the shoulders of the ring total 0.06 carats and all the diamonds are F to G in colour and Vs to Si in clarity and sparkle beautifully and have the added charm of being genuine antique hand cut diamonds in a genuine Art Deco setting. Measuring 11.5mm across by 12.9mm, the proportions of this ring is perfect and really looks so elegant and regal on the hand. A ring such as this is perfect for any finger including making a wonderful example of an Art Deco diamond engagement ring, and no matter which finger it is worn on, it will always be admired.